Winter's wind ripped down Fifth Avenue that January day, but inside the ballroom of New York's Plaza Hotel, Chinese silks and Fu dogs transported the elegantly dressed crowd to China's Imperial Summer Palace. Reporters hovered around the crowd, listening for the latest bit of high society gossip or trying to catch a glimpse of bigwigs such as J.P. Morgan, famous financier and one of the richest men in the world. But the newsmen were mostly ignored by the men and women of New York's highest social echelons, who were more interested in the exotic, longhaired beauties strolling the ballroom floor. As society parties go, this one was a real dog - for the gala social event was the first specialty show of the Pekingese Club of America, held January 18, 1911. And while it may sound a bit extravagant by today's standards, at the time the setting seemed fitting for a dog who was an eminent member of China's royal family. Without Buddhism there would be no Pekingese. In the Lamaist form of that religion, which has been popular in China at various times over the last 1,500 years, the lion is an exalted symbol. One problem - there weren't any lions in China. Luckily, somebody in the T'ang dynasty, which ruled China from 700 A.D. to 1000 A.D., noticed that the smallest Fu (guard) dogs lying around the palace resembled small lions. Voila! Faster than you can sing the chorus to "T'angs for the Memories," a legion of eunuchs were on their way to creating the Pekingese. Development of the lion dogs continued across several dynasties, but it was under the Manchu dynasty, which conquered China in the mid-1600s, that the Pekingese really developed. The Manchus hailed from Mongolia and were closely allied with the Dalai Lama in Tibet - some sources indicate the Lhasa terrier, which itself was a sacred dog to the Dalai Lama and his followers, was a significant influence on the Pekingese. Records show that several Lhasa terriers were presented by the Dalai Lama to Manchu emperors. 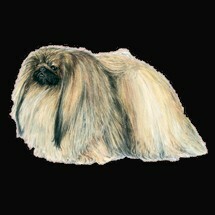 In any case, during the Manchu rule, the Pekingese developed the distinctive appearance we recognize today. The Manchus never won any humanitarian awards, but they knew how to treat their dogs. According to myth/legend/rumor, Pekingese had their own elaborately decorated apartments and were dressed in gold-embroidered costumes. They were fed large, multi-course banquets on porcelain bowls and plates by their personal servants, who slept at the foot of the dogs' beds should they need anything in the night. The Dowager's Dogs In the 1850s, a slave girl named Ye-ho-na-la caught the eye of Manchu emperor Hien Feng and bore him a son named T'ung Chih. Hien Feng's strong suit was breeding Pekingese, not directing foreign affairs, and England decided he needed a lesson in diplomacy, British Empire-style. So in 1860, a landing party from the H.M.S. Odin attacked the Imperial Summer Palace in Peking. The royal family escaped the raid but left behind a load of loot, including five of their precious Pekingese. British officers "found" the dogs and claimed them as their own - all in the name of diplomacy. These Pekes eventually found their way back to England, where one was presented to Queen Victoria. In a rare moment of good humor, the queen fittingly named her dog "Looty." Back in Peking, the plot thickened. Hien Feng died in 1862, and under dubious circumstances undoubtedly orchestrated by his mother, the 6-year-old T'ung Chih became the next emperor. The former slave girl Ye-ho-na-la, now known as Dowager Empress T'su Hsi, had maneuvered herself into control of one of the world's most powerful countries. On the minus side, T'su Hsi was cruel, ruthless, conniving and meaner than a snake on amphetamines. On the plus side, she loved her Pekingese. But even this affection had its ulterior motives. With only a tenuous link to the royal lineage, the Dowager Empress sought to identify herself with Buddha. In fact, she actively encouraged the nickname "Old Buddha." 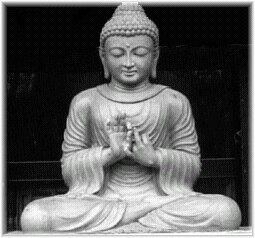 The Pekingese, a living symbol of Buddha, served her purpose in identifying her with the god. the royal connection and exotic appearance of the Pekingese, as the dog was dubbed there, made it a status symbol for the social elite - and those who wanted to be. In America, too, the lion dog was becoming the rage, especially as it became more available. In the late 1800s, T'su Hsi presented a number of her cherished Pekingese to Americans, including Miss Alice Roosevelt, daughter of President Theodore Roosevelt, and to J. P. Morgan, a dominant financier and philanthropist. With the Chinese monarchy collapsing - no thanks to the machinations of T'su Hsi - more and more Pekingese became available in the Chinese market. Many were exported from China by American and European traders, eager to capitalize on the Pekingese's booming popularity. The Pekingese Club of America was formed in April 1909 under the sponsorship of J.P. Morgan, who was named its honorary president. Two years later, 95 dogs entered that first club-sponsored show at the ballroom of the Plaza Hotel, which would continue to be its venue for many years. As they say in society, the Pekingese had arrived. Today few care or even know about the Peke's royal lineage, although some might say the Peke's temperament still reflects its regal bloodline. Whether it's because of blue blood or not, the Pekingese definitely has a mind and will of its own - it tends to want to get its own way. Despite its stubborn streak, the dog, fittingly, has the courage of a lion, so much so that many consider the Pekingese's independence and self-esteem its most endearing characteristics. It is definitely neither cloying nor servile. Firmness is needed with a Pekingese. But once it knows who is the master, it will respect authority and obey your wishes - at least some of the time. Lying around palaces for hundreds of years must have affected the Pekingese's activity level, for it is a relatively low-energy dog. The Peke does not require a great deal of supervised exercise. In fact, the dog will exercise itself if allowed the freedom to do so. And if it shares its life with children or another dog, a Peke will probably get all the exercise it needs to stay fit. Its small size, independent nature and relatively low exercise needs make the Peke an ideal dog for apartment dwellers, as well as the elderly. And although it may resent the very young if it is strictly a dog to the elderly or childless, if brought up around children, the Pekingese will adore them. In fact, the Peke generally adapts well to any environment. It's as much at home in a small apartment or on a large country estate, as the household's sole pet or as part of a large crowd of animals. It is not a good choice for someone who wants a dog that stays outside the majority of the time. Its long fur causes it to suffer in extreme heat, making it necessary to keep the Pekingese inside during hot summer days. n the reign of early Manchu emperors, small dogs were especially valued. Often, outrageous means were used to keep puppies small. According to some sources, the puppies were enclosed in tiny wire cages to stunt their growth, or the pups were grown in the palms of slaves' hands, passed from one to another and never allowed to touch the floor until the dogs reached maturity. To keep the Pekingeses' muzzles from growing long, they were fed from the inside of pigs skin - as the dogs tried to eat the tiny bits of flesh attached to the meat, their noses would bash against the hide, stunting growth. Eunuchs were employed to massage puppies' noses so that they would remain short. To her credit, T'su Hsi did not employ many of the cruel practices of her predecessors, although she did employ her own unusual breeding methods. The walls of her kennels were hung with exquisite tapestries and scrolls with pictures of ideal dogs in hope that this would influence the breeding process. The females were kept in quarters decorated in colors the empress wished the dogs' puppies to be. And she even had the eunuchs read specially composed poetry to the females describing beautiful dogs. As usual, the old dowager's preoccupation with color and markings had more to do with politics than aesthetics. She believed each color connoted some esoteric religious meaning, and that it was possible to tell the future by the color of a dog's coat. At times affairs of state were decided by the color of a newborn Pekingese. Today, few Pekingese owners pick their dog for its fortune-telling abilities, but many are attracted by its beautiful coat. Unfortunately, this initial attraction has a funny way of turning to aversion when the casual owner realizes that, as always, beauty requires hard work. But fear not - the secret to grooming the Pekingese is consistency. A few minutes a day, every day, should keep the dog's hair from developing into a tangled mess. This routine should be established early in the dog's life. Some owners take great pride in keeping the coat of the Pekingese very full. This, of course, is an absolute requirement if the dog is to be shown. However, most owners find this an overwhelming task and keep the coat cut back to a moderate length. Either way the Peke's royal appearance requires commitment. Unless you've got a legion of eunuchs to do it, expect to spend a lot of time grooming your Pekingese, or driving your spunky little lion dog to the groomer. It's been a long, strange trip from the ornately decorated chambers of Imperial Chinese palaces to the backyards and apartment buildings of America. While the Pekingese may no longer be feted annually at the Plaza Hotel, it does enjoy an enduring popularity, fueled by a sophisticated image. In 1998, it ranked 26th, with 11,734 new registrations, among the 146 breeds registered by the American Kennel Club. And although many may persist in the belief that the Pekingese is some kind of sissy, those that know these feisty, independent lions realize what the Chinese emperors recognized so long ago - the Pekingese is good company for the emperor or empress of any domain.